There's no need to book - just turn up suitably dressed and register on the day. Please wear some comfortable clothes that you wouldn't mind getting a bit wet and flat shoes. We will be operating from 12:45pm until 3:45 or until all the tickets have been sold. £5 per person (cash only please), with all proceeds going to Grove Cottage – the home of Bishop’s Stortford’s Mencap. Each session will be about 20 minutes. It's not just for kids - parents can have a go to! Grove Cottage runs a range of clubs which provide social and educational activities for people of all ages with learning disability. Over 120 members benefit each week from the experiences Grove Cottage can offer, developing potential, avoiding social isolation and bringing respite to families and carers. Bishops Stortford Canoe Club are delighted to be supporting Grove Cottage. BSCC is a racing club whose members compete at both local and national level in marathon and sprint kayaking and canoeing. Most of the people who join the club arrive with little or no prior experience, but the club’s volunteer coaches are able to provide all the training needed. It’s a great sport for all-round fitness and the competition element means that there is a constant challenge to improve. The club has a range of beginner and intermediate-level boats for use by those just starting out. For this event the coaches will be bringing along some extremely stable novice boats suitable for everyone from age 8 upwards. 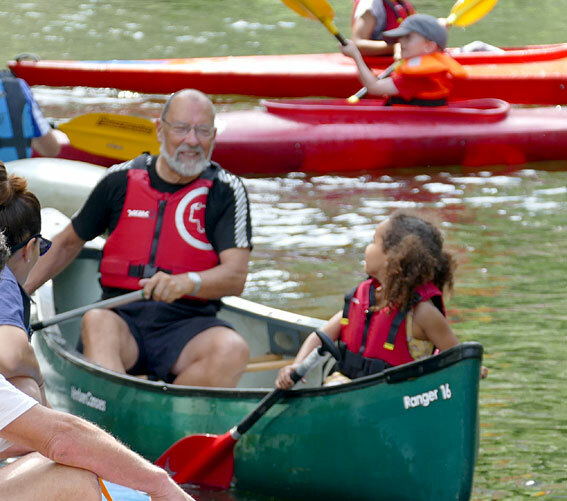 Younger children (age 5+) will be assessed by the coaches on the day and, if too small for the kayaks, will be accommodated in our coaches' open canoes.